An example of someone wakesurfing. Wakesurfing is a water sport in which a rider trails behind a boat, riding the boat's wake without being directly pulled by the boat. After getting up on the wake, typically by use of a tow rope, the wakesurfers will drop the rope, and ride the steep face below the wave's peak in a fashion reminiscent of surfing. Wakesurfers generally use special boards, designed specifically for wakes. The origins of wakesurfing are somewhat disputed with multiple people and companies claiming to be at the genesis of the sport. Some claims have set the dates for the origins of boat-surfing or wake-surfing as far back as the 1920s. However, no credible evidence of this is available. Footage and print media from the 1950s and 1960s show ocean surfers actively riding surfboards behind motor boats. By the mid 60's numerous surfboard manufactures laid claims to building wake specific boards. The practice of riding surfboards behind boats continued through the 70s and 80s with the boards being ridden evolving to shorter forms right along the shortboard revolution in Surfing. As boards progressively shortened in length, taking a page from windsurfing or sailboarding many practitioners started using devices mounted to the board to strap and secure their feet in place. Aided with a tow rope, hard carving and launching off wakes lead to sports like skurfing, skiboarding, and eventually wakeboarding. Wakeboarding's growth and mass appeal led the watercraft industry to advance technology to increase the size of wakes. This, in turn, provided an opportunity for wakesurfing to emerge from the shadows. Several sport pioneers, including, but not limited to Tim Lopes, Jerry Price, Jeff Page, Rick Lee, Mark Sher, and others are noted with being at the forefront of modern wakesurfing. 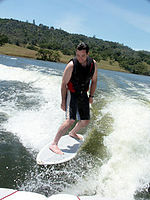 The first US design patent for a wakesurf was granted to Alfonso Corona in 1997. Inboard ski/wakeboard boats are the most popular choice for this sport as the propeller is under the boat, and are less likely to make contact with the rider. Owners of inboard boats place ballast, such as water, lead weights, concrete, or other heavy objects in different sections of the boat in order to weight the boat down and create a larger wake. The best weight configuration for wakesurfing is to place the majority of the weight near the back corner side on the side you're surfing on. The deeper the boat is in the water, the bigger the wake will be overall. In addition, you will want to place a larger amount at the stern of the boat on the side which the rider is riding. This will ramp the wake up on the side the rider is riding and washout the opposite side. A rope length of 8 to 10 feet is recommended. Wakesurf intended ropes are generally 20 feet long, making it ideal for boats that have a tower set up. Long ski and wakeboard ropes can become hazardous for wakesurfing, because it usually involves winding up the rope or tying unnecessary knots. 720 spin – Rider spins continuously 2 complete 360′s. In 2013, Canadian musician Chris Hau recorded a video in which he played a song on an acoustic guitar while wakesurfing. In February 2015, Hunter Sims, a professional wakesurfer, received a world record for doing 106 shove its. ^ WakeMAKERS. "Weight Your Boat for Wakesurfing". Retrieved 4 April 2014. ^ Fly High. "How to Weigh a V-Drive Ski/Wakeboard Boat" (PDF). Retrieved 2 November 2011. ^ Boarders (October 6, 2014). 2014 World Wake Surf Championship, Las Vegas". Retrieved 22 July 2016. ^ Mills, Carys (2 August 2013). "Does this wake-surfing singer have what it takes to go viral?". Toronto Star. Retrieved 17 September 2013. ^ Cross, Alan (1 August 2013). "Canadian Dude Sings, Plays Guitar and Surfs AT THE SAME TIME". AlanCross. Retrieved 17 September 2013. ^ "Most consecutive wakesurfing shove its". Guinness World Records. Retrieved 2016-10-24. This page was last edited on 8 February 2019, at 16:56 (UTC).